While I don’t typically do “empties” posts, I will tell you that I just finished my bottle of Odacite Divine Rose & Neroli Balancing Toner Mist and am quite sad that it’s empty. Back in March, I shared with Sarita’s readers that I liked to use Odacite’s Divine Rose & Neroli Balancing Toner Mist at night before applying Stark Skincare’s Neroli Midnight Oil. It’s been such a heavenly combination for those weeks when my skin is behaving (which, ahem, currently, it’s not), and I’m hoping to restock the toner mist next month when I’m in Los Angeles for A Night for Green Beauty. When it comes to toners, I have two separate needs, thus two separate collections: Moisturizing and Acne-Fighting (and sometimes there’s a toner that meets both of those needs!). 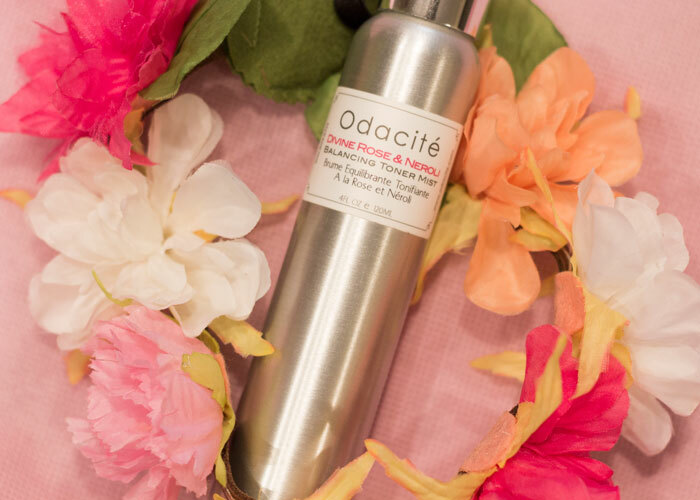 Odacite’s Divine Rose & Neroli Balancing Mist falls into the “moisturizing” category, as I don’t really find it to do much for acne, though it does contain Aspen bark extract, which is supposed to have astringent-like properties to keep pores small and clean. Seeing how I use this during good skin times, I suppose it helps with keeping my pores small and clean, but really, it’s all about the soothing, softening powers of this toner mist for me. Thank you, aloe and rose! This toner also does do a lot for my mood. For starters, I find the scent absolutely gorgeous — if Odacite made this into a perfume, I’d buy it! Each spritz brings a bouquet of roses and fresh-squeezed oranges to your senses, and there’s almost a touch of sweet honey as the mist dries and the scent rounds out. It’s perfect for spring and summer, because hello freshness, but it’s also one to keep during the cooler fall and winter months to remind yourself that roses and oranges are just around the corner. So, final verdict: I think I already told you. I’m buying this next month. Odacite is just one of those brands that seems to nail it with almost every product. What’s been your experience with Odacite? Do you have separate toners for separate needs? What scents do you like? Tell me in the comments section!